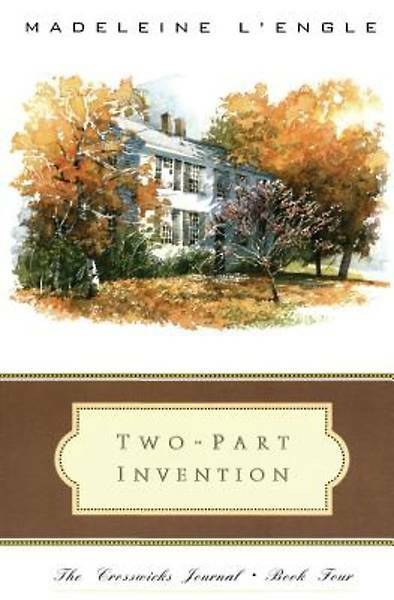 Chapter One Crosswicks is a typical New England farmhouse, built sometime in the middle of the eighteenth century, so it is well over two hundred years old. Its square central section has been added to haphazardly over the years, white clapboard somehow tying it all together, so that the house rambles pleasantly and crookedly. A dropped ball will roll right to the central chimneys, and the bookcases we've built in are masterpieces of non-alignment.Crosswicks is a symbol for me of family and community life, of marriage in general and my own marriage in particular. It stands staunchly on the crest of one of the Litchfield hills in the northwest corner of Connecticut and through the centuries has withstood the batterings, of many storms -- blizzards, hurricanes, even a tornado -- of love, anger, birth, death, tears, laughter.Perhaps it is a particularly potent symbol for me because, until the house came to us over forty years ago, I had never lived in a real house, much less had one of my own. I was born on the asphalt island of Manhattan and lived for my first twelve years in an apartment. I had my own small back bedroom, its one window looking onto a court, where the stories of other city dwellers were sometimes enacted for me behind unshaded windows or on the rooftop of a building lower than ours. I was an only child, with an ailing father, and lived a solitary life. My parents had dinner at eight o'clock in the evening, and I had my meal on a tray in my room and ate happily, with my feet on the desk and a book on my chest.It was a totally different childhood from that of my husband, Hugh Franklin, who had a much more typically American up-bringing, growing up in Tulsa, Oklahoma, in acomfortable, unpretentious house on a pleasant, tree-lined street of similar houses filled with professional father, stay-at-home mother, and many other children on the block to play with.How different were Hugh's and my early years; each of us was given different treasures, different sorrows. I grew up in a world of books, music, theatre, a small world where the artist was the norm, rather than the odd one out.Hugh grew up in a world where artists were thought to belong to a half-world of permissiveness and promiscuity. His father was a distinguished lawyer, and there were books in the house, though not many, according to the standards of my parents. The First Baptist Church was central. Regular churchgoing was compulsory. To be a "Christian" was essential.My mother and father were Episcopalians, but being a "Christian" was secondary (if it was thought about at all) to being a good and faithful singer, or painter, or writer.Totally different worlds.My father was a writer, a journalist and foreign correspondent and news analyst, though mustard gas in the trenches of World War I stopped much of his traveling. My parents' friends were painters, sculptors, singers, actors, composers. The world of the nineteen-twenties seemed a world of parties. A terrible war had ended. People played almost frantically. Mother and Father were either dressing to go out to a party or the theatre or the opera or they were preparing to have friends come in.I was on the fringe of that world, a child isolated in my own room, but aware of and taking for granted the music, the laughter, the conversation going on in the rest of the apartment.My parents had been married for nearly twenty years when I was born, andalthough I was a very much wanted baby, the pattern of their lives was already well established and a child was not part of that pattern. So I had my own, with which I was well content, reading and rereading, writing stories and poems; illustrating my stories with pencil and watercolors; playing the piano; living far, too much in an interior dream world. But that interior dream world has stood me in good stead many times when the outer world has seemed to be collapsing around me.After my childhood in New York came a time of wandering about Europe, trying to find air clean and pure enough for my father's damaged lungs. World War 1, which had little place in Hugh's early life, remained paramount in mine, along with the fear of war.What I, overprotected by my solitude rather than my parents' design, did not realize was that the terrible Wall Street crash of '29 had affected everyone's lives. More imminent was the fact that my father was in the hospital with pneumonia, that my mother could not hide that she was frantic with anxiety. Then the crisis was over and he was home, but nothing was the same.We were moving, leaving New York and moving to Europe. The doctors had recommended a sanatorium in Saranac, but after the crash, with its consequent Depression, my parents could not afford Saranac. The standard of living in the French Alps, where the air was clean and clear, was much lower than the standard of living in the United States. The Depression had closed down most of the great resort hotels. There were no "beautiful people" and the world was a war away from the jet set. Most of the available pensions around the emptied resort hotels had no indoor plumbing and no running water. But theair was the clean, dry air the doctor had recommended. If we stayed in New York my father would be prone to another attack of pneumonia, which might well be lethal. We had to move away from everything I had known.How my parents must have missed the opera, the theatre, the parties that had been so much a part of their lives in New York. But they shielded me in their Olympian way from feelings which must have bordered on desolation.